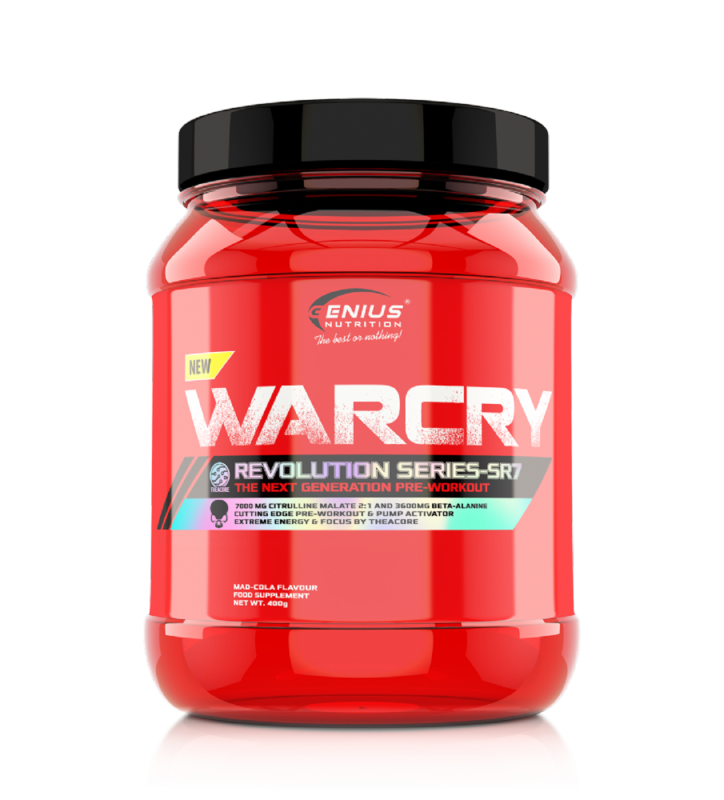 Warcry is a cutting-edge pre-workout which takes a step in the game. For us, good has never been good enough and therefore we have formulated Warcry for more strength, pump, concentration and energy, and the ultimate training experience. This next generation formula is based on a scientifically combination of beta-alanine and citrulline for an unparalleled pumping effect. The powerful mix of choline, theanine, and tyrosine will take your body to the next level, while the precisely dosed combination of caffeine, theacrine, and olive leaf extract will give you an incredible boost of energy and will increase your concentration. L-citrulline is an amino acid which is converted into L-arginine shortly after it enters the body. Contrary to the general belief, L-citrulline is more efficient than L-arginine. Besides, arginine has an extremely slow absorption rate. Therefore, we use only citrulline which is converted into arginine and supports nitric oxide production and pumping. Nitric oxide plays an important role in vasodilation and blood circulation. The increase in the nitric oxide levels triggers blood vessel dilation and, as a result, blood delivers more oxygen to muscles. Beta-alanine supports the production of carnosine and acts like a buffer between lactic acid which causes fatigue and muscles. Carnosine reduces the amount of lactic acid which builds up in muscles during high-intensity workouts. As a result, you will benefit from increased endurance and energy for high-intensity or explosive workouts and you will see an improvement in your overall performance. It is the most powerful natural antioxidant and it has numerous health benefits. 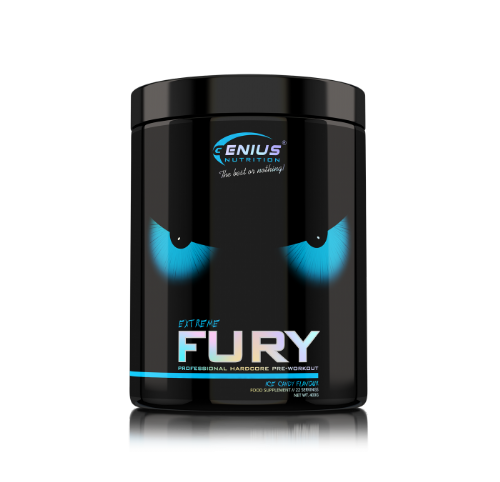 It boosts nitric oxide (NO) production and, in combination with citrulline, it significantly enhances the pumping effect. Most neurotransmitters are amino acids. According to UMMC (University of Maryland Medical Center), L-tyrosine plays an important role in the production of epinephrine, norepinephrine, dopamine, and serotonin. These neurotransmitters control mood and behavior, and tyrosine supplementation increases motivation and metal clarity before workout for an improved mind-muscle connection. Taurine is a specialized amino acid which is important when it comes to strength and endurance. Taurine levels decrease during exercise, which results in impaired endurance performance. LCLT boosts energy and it has been proven to increase nitric oxide levels and reduce muscle damage after anaerobic workouts, such as bodybuilding, weight training or CrossFit routines. LCLT particularly enhances oxygen delivery to muscles during anaerobic training. Caffeine and L-theanine work synergistically and deliver better results than the individual compounds. 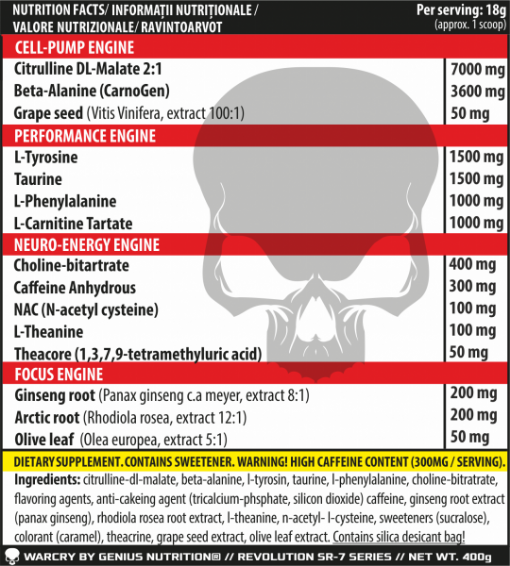 L-theanine is a nootropic that counteracts many undesirable side effects of caffeine, such as hyperactivity, lack of focus, muscle stiffness, and impaired sleep. This combination makes Warcry one of the best caffeine-containing products. Theacrine is a natural substance derived from herbal extracts and found in Kucha, a traditional Chinese tea. It works similarly to caffeine in that it reduces fatigue and anxiety, and boosts physical performance. Theacrine works with the body's natural metabolic processes to deliver long-lasting energy, increase mental clarity, and improve mood and motivation. In particular, theacrine activates D1 and D2 dopamine receptors which enhance dopamine release to boost energy, improve mood and increase focus and mental clarity. As a result, it promotes wakefulness and alertness, concentration, a better body coordination, and improved performance in cardio and anaerobic training. Unlike caffeine, theacrine significantly boosts energy and performance without causing a tolerance build up over time. Theacrine has complementary and synergistic effects with the other ingredients, and this shows in the powerful Warcry formula and its proven results. This ingredient supports brain function, improves mood, response time, concentration and mind-muscle connection during workout. In combination with caffeine, L-tyrosine and theacrine, it helps achieve mental clarity and concentration without crash during workout. A special combination of herbal extracts that is not found in other products or is found just in small amounts. These herbs quickly and effectively boost energy and concentration, and support body's natural resistance to physical and emotional stress and fatigue which makes Warcry the perfect pre-workout choice.